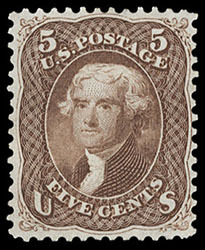 1863, 5¢ brown, traces of o.g., bright and fresh with rich color and a sharp proof-like impression, Very Fine and choice, a lovely stamp; with 2001 P.F. certificate. Scott No. 76 $525 for no gum. A link back to Sale 81 - Lot 753, along with its description, will be appended to your message.